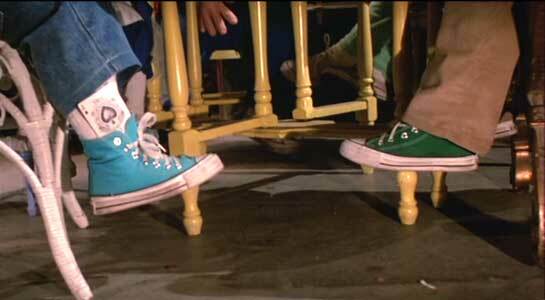 Mackenzie Astin, Ron MacLachlan, J. P. Amateau and all of the stunt people wear black, white, blue, green, purple and other colors of high top Converse “Chuck Taylor” All Stars in the film. 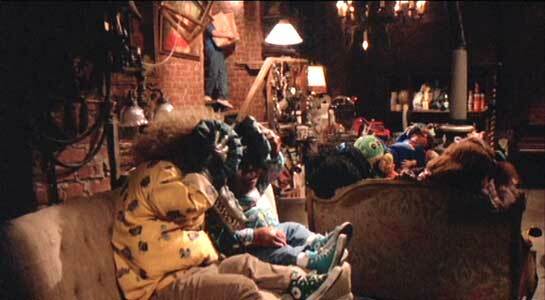 The Garbage Pail Kids inside the basement of Captain Manzini’s magic shop. The Garbage Pail Kids Movie (1987) is based on a popular trading card series that spoofed the Cabbage Patch Dolls. The cards were so gross they were banned by many schools, which probably only made them more popular. To capitalize on their popularity, a movie was made that is considered one of the worst of all time. Not only did it appear on every critic’s worst of the year list in 1987, it has a 0 percent at Rotten Tomatoes and a 2.7 rating on IMDb. Dodger (14-year-old Mackenzie Astin) works for magical shop owner Captain Manzini (Anthony Newley, songwriter for “Doctor Dolittle” and “Willy Wonka”). One of the treasures inside the shop is a scum-encrusted garbage pail that holds disgusting extra-dimensional beings so repugnant they must be imprisoned forever. Outside, Dodger is bullied by Juice and his crew, which includes fashion designer Tangerine (15-year-old Katie Barberi). Dodger has a crush on Tangerine, and leers at her. He invites her into the shop when Juice and his crew bully Dodger. During the scuffle, they open the Pandora’s Box that is the garbage pail. After Juice and Co. leave, they creatures inside help out Dodger and introduce themselves. Juice and his gang bully Dodger. Each of the seven Garbage Pail Kids has a name that is secondary to their gross-out feature. One has an excess of mucus, one is a violent greaser, one vomits, one is a baby, one is flatulent, one wets himself profusely, and one is an alligator that eats people toes. They have no personality beyond these traits and are obnoxious. The plot is that Dodger keeps the Kids trapped in the shop’s basement to produce stylish clothes for Tangerine, which she sells for cash at a club. In exchange, Dodger has agreed to help the Kids find their missing comrades who are mostly likely being imprisoned in the State Home for the Ugly, a thing that does not exist anywhere. So, while Tangerine leads Dodger on, the Kids toil. It is the worst possible showcase for their “talents” that could have been conceived. Meanwhile, Manzini is working on a spell to cast the Kids back into their Pail. For an hour or so, the film meanders. At one point, the Kids go to the movie where they annoy everyone and to a bar where they befriend the bikers contrary to all logic. Later, after the Kids have made an entire line of outfits for Tangerine and are denied being allowed to go to the fashion show, they’re abducted by Juice and sent to the Home for the Ugly. Dodger rallies the bikers, frees the Kids, and then attack the fashion show. It ends with the Kids receiving the gift of freedom. They go off to annoy even more people with their offensively crude, intolerable behavior. The alligator is interested in eating toes. Luckily Dodger has on a pair of chucks. Garbage Pail Kids is awful. It should be seen by everyone who likes movies. Not because it is so-bad-it’s good, but as a study in how lowly and bad a movie can be made. Every single character is unlikable. The puppets themselves are inanimate. It is joyless, without style and utterly humorless. The whole Dodger/Tangerine thing is weird. They’re close to the same age, but he looks 12 and she looks 19. Its sets off some weird vibes. The best thing that can be said about it is that it fails to deliver. Imagine if the film had succeeded and was about gross kids who fart and vomit and stuff. It’s actually better that it’s about nothing worth noting, with dubious messages about how being ugly is an adventure and working together to accomplish anything. Juice dumps Dodger into the trash bin, along with the movie script. Dodger finally gets his revenge on Juice. On one positive note, in terms of movies that showcase chucks, this movie is rich with them, as most of the Kids, Dodger and one of Juice’s thugs wear them to show how cool and rebellious and hip they are. 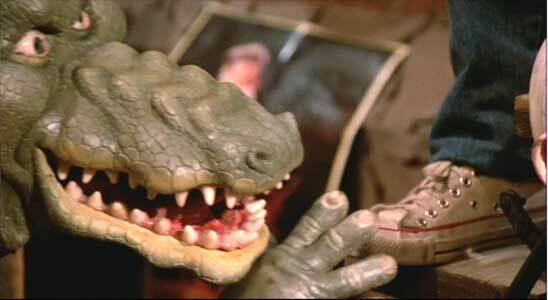 The awful film betrays that, of course, but still, they’re there. In the climactic fashion show fight, Dodger, wearing a silver glitter bowtie, white tank top and black chucks with a checkered pattern on them gets an aside from the kid that farts, does a flip in the air and lays a beating down on Juice. There are also many dozens and dozens of shots of the Kids in their chucks. The Garbage Pail Kids wear different colored high top chucks. Another scene where Dodger gets bullied by Juice’s gang. The only one doing well in this film was the chucks salesman. The Garbage Pail Kids Movie. (1987) Mackenzie Astin, Anthony Newley, Katie Barberi, Ron MacLachlan, J. P. Amateau, Marjory Graue. All the stuntmen wearing the Garbage Pail Kids suits: Phil Fondacaro, Debbie Lee Carrinton, Kevin Thompson, Robert Bell, Larry Green, Arturo Gil, Susan Rossitto. Directed by Rodney Amateau. Categories: Action/Adventure, Science Fiction/Fantasy.